New book, 372 pages. One December night in 1942, a Nazi parachutist landed in a Cambridgeshire field. His mission: to sabotage the British war effort. 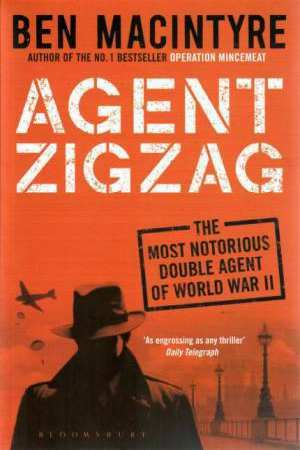 His name was Eddie Chapman, but he would shortly become MI5's Agent Zigzag. Dashing and louche, courageous and unpredictable, the traitor was a patriot inside, and the villain a hero. The problem for Chapman, his many lovers and his spymasters was knowing who he was. Ben Macintyre weaves together diaries, letters, photographs, memories and top-secret MI5 files to create the exhilarating account of Britain's most sensational double agent. This item was added to our catalog on Friday 21 December, 2018.